I was tidying out my cupboards, you know the decluttering thing! I got side-tracked by some old photos of my heyday, lol. One particularly got my attention. I would publish it, but, as me and my friends were in skimpy attire they might object? I don’t – I didn’t half look too bad then! I nearly did, but you never know who reads your blog, it is surprizing. When I had a patch of not blogging earlier this year, a number of people who I thought didn’t know I have a blog got in touch and enquired why I had stopped. Well anyway the photo was a reminder of the crazy things we used to do, we had no fear of looking silly, and we were just after a bit of fun. I have lost touch with all of them; I live in a different part of the country and my lengthy time overseas lead to a gradual fading of friendship. I suspect they all became good mums and became proper. I say that as I was the one that lead the mad escapes. I have never been one to follow the expected. I have always bucked at restrictions, rules, if there is a reason for them then yes I will follow. This part of my nature has lead me to be on the outer, but I am comfortable about that. I suspect it is part of being an artist. I did the above acrylic wondering where they were and if we had stayed in touch would we still be goddesses doing crazy things? So Vicki, Pam, Heather and Alison if you are out there are you still being crazy goddesses? Can you guess which one is me! Linking to Paint Party Friday and all the wonderful artists there. Love it, so original and fun! Love your crazy ladies,its fun. 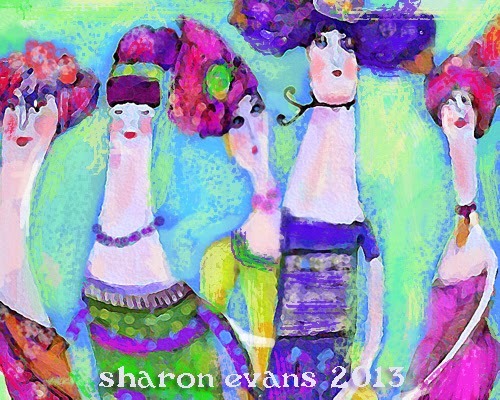 My wild guess is the purple lady :-) Love this painting, Sharon, how fun it would be to get out and about with you! Thanks, have a great weekend. Yes I am the one in purple. Nice fun painting, and good to look back and reminisce! Love the painting, Sharon. Some friendships hold together forever. I still keep in touch and see every few years 3 of my first grade girl pals (from 1940). I love these ladies from the day. Wonderful in colorful attire. I love these ladies. It reminds me of toulouse Lautrec (not sure how his name is spelt) and his Moulin rouge ladies. I'm guessing you are the one up front that the others are looking to take the lead,going by your post! I like that you did your own thing and didn't conform-i think you're right it is a creative thing . Yes I am the one in purple! Wow...super gorgeous art..so full of life and radiance and spirit..and so beautifully written...I loved hearing about your fun times...I can totally relate to what you shared too..and that artist-spirit within that gives such freedom! Thanks for shining your magic into my heart today..a stunning and memorable painting..so richly meaningful! Oh Sharon this is such a fun painting, full of character and fun, I love it! I'd say you were the purple lady leading the crazy pack! Yep I am the one in purple! Thanks for the christmas card, what a surprize and I love the glitter you added! Oh I love these gals so much, ..so unique and cool!! I am so glad I'm not the only outsider wild goddess that tamed over the years!! In retrospect I see that it truly was the artist within that made me a bit quirky. Thanks for sharing this side of you..... I wish you could send me the photo....I'd love to see it!! Your story makes me sigh. Why aren´t we like we used to be?? I love your girls, they are cool! Such a fun painting! I love the story behind it - we are never too old to be crazy with our friends! I think it just may be what keeps us young! Why just tonight, I posed with my 4 cousins in a photo booth with all kinds of props at a wedding! We had 10 seconds between takes - and they were crazy shots! I had to repeat it with my favorite aunt, and then with two of my children! So fun to clown around with loved ones! This is absolutely fabulous! What a gloriously fun painting! I love this! Too cute. I just LOVE your long-necked ladies, they are such fun, and I like the blue outlining around them. It's such a happy painting, you must have been a crazy, jolly crew. This would make such a great, saleable postcard or greetings card. I also thought you were the lady in purple - how strange that we can identify you just from 'knowing' you through your blog! I have had great pleasure reading your blog and admiring your work during the past year, and always appreciate your nice comments. I wish you and yours a happy and peaceful Christmas, and a good year in 2014. Decisions - 30 Paintings in January?